HONOLULU (AP) _ A parachute failed to inflate during a NASA test of new technology for landing larger spacecraft _ and eventually astronauts _ on Mars. NASA spokeswoman Kimberly Newton said in an email Monday that the parachute deployed but failed to inflate. She says the agency would have more details during a news conference on Tuesday. The test off the Hawaiian island of Kauai is investigating technology designed to slow down a large landing vehicle as it falls through the atmosphere at supersonic speeds. The descent started 34 miles above the Earth’s surface, where the environment is similar to Mars’ thin atmosphere. 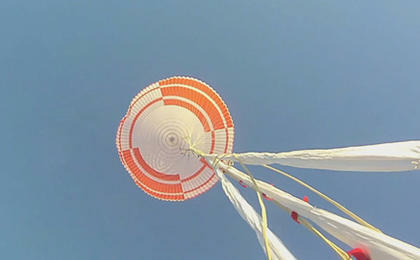 Another giant parachute also failed to inflate during a similar NASA test of new Mars spacecraft technology last year. One of the main goals this year was to test the redesigned parachute.